I’m in Thailand (at the World Editors Forum) and the news is full of protest all over the world: Bangkok itself, Turkey and in the unpredictable places where the ladies of Femen pop up and take off their clothes. Protest needs innovation as much as any department of life and perhaps it needs it more than most because protest goes nowhere if it isn’t noticed and doesn’t spread. Innovation is deviation and new protesters must find new and original ways to imprint a message instantly in as many minds as possible, preferably without words. It must be an image delivered instantaneously because protest can be snuffed out fast and because there is anyway so much else competing for peoples’ attention. Compelling visual wit is harder than it appears. The examples above represent a remarkable cluster of originality in this specialised global competition. In Turkey, they wave beercans to protest against new restrictions on alcolhol. Much better, a hundred or so people held a kiss protest at a subway station in Ankara to make fun of the increase in rules on public behaviour. Here in Thailand, demonstrators have reached back into an example distant in both geography and time. 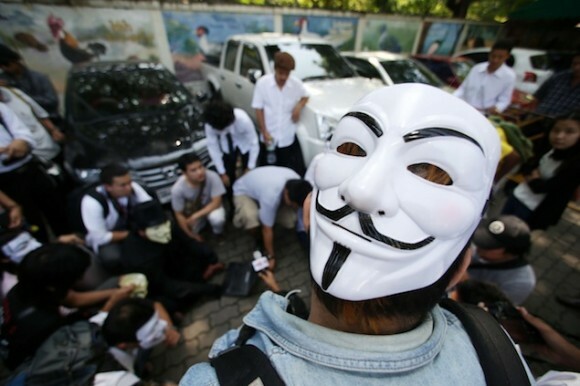 Political movements in Thailand have long been signalled by colour (yellow vs red mostly) but yesterday, the anti-goverment crowd wore Guy Fawkes masks and the (equally peaceful) counter-demo wore red masks. Needless to say, young Thai activists have not been reading books about 17th century British history. They picked up the cue from the 2005 film V for Vendetta in which people march on the parliament in London wearing the masks. (The use of these masks isn’t confined to Thailand and didn’t start here – examples here – but looks especially odd so far from its origins). Although the people who wear the Fawkes masks and pepper government Facebook sites with pictures of them are formally objecting to the government, I guess that the choice of symbol also an oblique swipe at the monarchy and its political role. Legal penalties for lèse-majesté are so heavy that argument on the subject is often oblique (see here (£) for recent cases). Perhaps most extraordinary – and certainly most dangerous – are the highly mobile women on Femen who strip off to reveal slogans on their bodies. To do this in a country like Tunisia (their latest target) requires nerve, to which they add creative flair in their ability to get a message across in a way so provocative and annoying to the authorities they’re trying to ridicule that it can’t be smothered. Do people who later succeed in advertising start as street politicians? I can’t think of examples but it wouldn’t be surprising. This entry was posted on Monday, June 3rd, 2013 at 5:41 am	and is filed under South Asia, Wit. You can follow any comments to this entry through the RSS 2.0 feed. Both comments and pings are currently closed.